Seluxit - Smart products? We wrote the book. Smart products? We wrote the book. Can Denmark keep its leading edge in the development of smart products in the global market? The 10.000 member companies of the The Confederation of Danish Industry (DI) are looking to Seluxit and our peers to help ensure that the answer is yes. 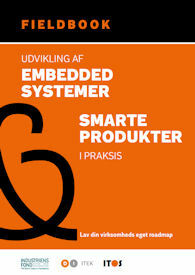 Seluxit has been featured as one of 4 exemplary case studies in the recently published smart-product “Fieldbook” (Danish language) funded by the Danish Industry Foundation and the Confederation of Danish Industry, and written by a consortium of companies and research institutions. Companies producing traditional products are realizing that they need to integrate services into their products to keep their competitive edge. But to create smart products, companies need to develop new competencies. But how? The Fieldbook is the smart-product go-to guide to answer that question. The Seluxit case study (p 67) highlights how we work together with Aalborg University to model conflicting in-home systems through advanced modeling using UPPAAL software, striving to create fully autonomous systems of systems. The Fieldbook is just one of several project initiatives we participate in, allowing us to hone and tame the cutting edge.